Swansea Japanese Knotweed Study – A Leap Forward in Understanding this Problem Plant? I read with interest about the publication of a “major study” into the treatment of Japanese knotweed – then I read with some surprise that “Japanese knotweed can’t be eradicated”. I was particularly surprised, given that eradicating Japanese knotweed is what I do. Unfortunately, what I was reading wasn’t the results or the abstract of the study, but instead a carefully crafted press release, regurgitated by journalists who probably don’t have an in-depth understanding of the science behind it, and most likely headlined by people with no practical experience of Japanese knotweed. So, this survey proves you definitely can’t eradicate it, then? What is even more confusing, given the “no cure” headline in the Telegraph, a different story published today about the same study states that ‘a team of bioscientists at Swansea University have developed an effective way to tackle Japanese knotweed’. Again, there is no detailed information on what this would be, and no link to the study or the details of the treatment method. Oh, sorry – it’s called “the Four Stage Model”. That makes it all clear, and I’m sure it’s not at all like any of the other “proprietary”, “unique” or “new” systems that various existing companies tout on their websites, which turn out to just be (a combination of) the same method that companies like ourselves have been working with for over 15 years – but with a different name. I have been reminiscing recently about Dr Ben Goldacre’s excellent book ‘Bad Science’ and the many issues that it highlights about modern media reporting of science, and scientific studies in particular. In its favour, this press release does come out strongly against companies who state they can eradicate Japanese knotweed “in one spray” or “in one year” – when this is demonstrably not the case. However, the story also rings a lot of the “science reporting” alarm bells that Dr Goldacre outlined in his book, as well as raising a lot of the concerns that I, and others at the trade body INNSA have about certain companies in our industry. No links were provided to the study itself, and the stories I have read on five different websites all contain the same quotes from the same three individuals – one of whom, a Dr Jones, is referred to as both a co-author of the study, and also ‘the founder of a consultancy that solves… invasive plant species problems’. What’s more, Dr Jones’ PhD was sponsored by a company which offers Japanese knotweed remediation. Oh, and I did finally find an external link in one of the stories – it’s to the consultancy that Dr Jones founded. I am not suggesting that either the researchers or the sponsoring company have done anything that isn’t above board – on the contrary; the arrangement makes sense, and industry funding is of great value in research and development – however, this information doesn’t feature in the major coverage of the story, and when some of the information is coming from a representative of a commercial company, it’s much harder to take the conclusions that they draw from the science at face value. Given there is no actual data available at this time (although the study concluded in 2016), and given there is no mention that the study has been peer-reviewed this raises another red flag. Confusingly, some of the quotes refer to three years of trials, and another refers to five years, and one of the researchers refers to starting the study in 2011. In any case, this “major study” covered two sites. To give you an idea of how “major” that is, Japanese Knotweed Solutions have treated fifteen hundred (yep, 1,500) individual sites over that period, and carried out well over five thousand treatment and monitoring visits in that time, on a wide variety of sites across the UK, remediated using every widely-recognised remediation method in the industry. In some significant respects, the study supports what we found in our own experience over that time, and what we have known for over 15 years: that treating Japanese knotweed with glyphosate generally takes over three years. That’s why Japanese Knotweed Solutions recommend five-year treatment and monitoring plans for all glyphosate herbicide treatments, and why we provide insurance-backed guarantees for all domestic projects for the five years following treatment. We also recognise that it’s possible to carry out herbicide treatment in such a way that it can take longer than five years in some cases, particularly where a mix of herbicides is used, or applications are made at inappropriate times. For these reasons, I also have major concerns over the methodology of the study – I am sure my own university tutors would have been poking holes in it just as I am. The concerns could have been factored in or controlled out of the study, but without being able to review the study itself, we can’t answer these questions. 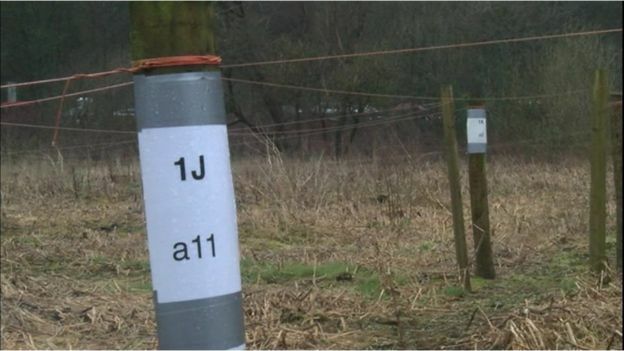 Judging by the photograph on the BBC site (and assuming this is of the trial), it would seem that a variety of different methods have been deployed in areas of surface growth that are all adjacent to (or very close to) one another. This means that the rhizome (or underground “root system”) of these plants is in fact all interconnected. There is a good chance that this whole field is actually one large plant – and that matters. A lot. Dr Eastwood states ‘Our research tested more methods of control than any other invasive species trial ever conducted’. Unfortunately, it seems that it tested them all on the same root system. If you were testing pharmaceuticals, you wouldn’t test 19 different drugs on the same patient at the same time! Whether un-treated buffer strips have been left between is also not clear – but this would again have a significant impact on the treatment, as leaving buffer strips would allow areas to grow unhindered, and potentially re-invigorate the plant’s rhizome; working with no buffer strips would increase the likelihood of multiple treatments being applied to the same plants – although in practice, the plant’s own mechanisms would mean that herbicides would be translocated to sections of the rhizome in a way that could not be controlled by the researchers. What you have here, is a plant with an extensive underground network that can store energy and create new growth, that is being attacked in some areas, but being left relatively un-harmed in other areas. It’s under attack, but not in the way that any of the individual treatment methods (particularly the herbicides) recommend. The best approach to such a study would be to carry out each different treatment across all of the surface growth associated with a single rhizome, and critically not to apply more than one treatment to one plant. This is exactly what Japanese Knotweed Solutions have been doing for over fifteen years, with a great deal of success. So, what does JKSL’s experience show? Removing material from site is a reliable, tried-and-tested way of remediating Japanese knotweed, if carried out by suitably competent individuals, using the methods outlined in the INNSA Code of Practice – Managing Japanese Knotweed (and formerly the Environment Agency’s Code of Practice – Managing Japanese Knotweed on Development Sites). Furthermore, on-site burial has a successful track record of controlling Japanese knotweed, and is supported by the Environment Agency, and is included in their Regulatory Position Statement 178 . Industrial composting of Japanese knotweed has been shown in at least one study to successfully kill the plant material (including roots). Numerous additional studies show that sustained temperatures of over 50°C will eventually kill all plant material, and that temperatures of around 80°C will kill all the plant material tested within a matter of hours (including Japanese knotweed). Furthermore, Japanese Knotweed Solutions’ own MeshTech is a patented product has been tested by an independent scientific study, and has been deployed by JKSL on numerous sites, resulting in successful eradication of the plant. It’s not a mysterious “unique system” – we’re very transparent about what it is, and what it does. It’s durable, environmentally friendly and we’ve been in talks with people from across Europe on how to implement it in practice, giving the benefit of our experience of using it within the UK. So, while JKSL broadly expect the results that this study has shown, we think that headlines stating that ‘Japanese knotweed cannot be eradicated’ are very misleading. All this demonstrates is that if you want the best help and advice in managing a Japanese knotweed problem, you should come to a company that has over 15 years’ experience on the ground; my advice would be to steer clear of companies offering “unique new solutions”, particularly where the company has no track record of successful eradication, and even more so if their experience is limited to only two sites.